La'o Hamutuk distributed some ideas to the Development Partners meeting, along with our initial comments on the Strategic Development Plan. The following is the introduction and extracts from our statement; the full text is on our website. For more than a decade, La’o Hamutuk, as a Timor-Leste civil society organization, has been observing and analyzing the activities of Timor-Leste’s development partners and decision-makers as this nation emerges from war and occupation into peace and democracy. La’o Hamutuk appreciates your hard work to make international assistance to Timor-Leste more effective, and we have observed improvement since 2000. During that time, the global aid community has learned lessons. We have written a separate paper with our preliminary observations on the Strategic Development Plan. This paper complements that one. Some of our comments refer to the “Principles for Good International Engagement in Fragile States and Situations,” but we are writing specifically about Timor-Leste. 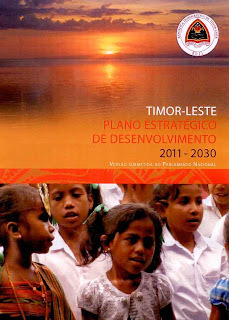 Please understand Timor-Leste’s complete context. Ongoing impunity makes this democratic state more fragile. Timor-Leste is a petro-state without much petroleum. External debt will make Timor-Leste more fragile. The Resource Curse is a key element of Timor-Leste’s context and fragility. Statebuilding is not the only objective. Prioritize prevention with long-term planning and earlier-warning analysis. Planu Estratejiku Dezenvolvimentu (PED) ne’e nudar dokumentus importante, no halo mudansa barak ba versaun ne’ebe sirkula iha tinan kotuk. Maske, ne’e dokumentus boot, ho ideias foun barak, ne’ebe presiza duni diskusaun ida ne’ebe klean molok hetan aprovasaun. Ami hare katak ida ne’e iresponsavel katak Konsellu Ministru aprova planu ne’e hafoin ekontru kalan tomak, no ida ne’e sei sai inkonstitusional ba Parlamentu atu aprova planu ne’e menus semana ida hafoin sira simu esbosu ne’e husi Governu. Planu ne’e inklui fokus ba kapital sosial nian, laos deit infraestrutura fiziku hanesan diskusaun sira ne’ebe akontese iha tinan balun liu ba. Ami hein katak orsamentu futuru nian sei refleita ba ida ne’e, no osan balun husi 52% Orsamentu Jeral Estadu 2011 ne’ebe aloka ba infraestrutura fiziku nian sei aloka fila fali ba edukasaun no saude. Ami aseita katak planu ida ne’e laos orsamentu ida, maibe planu ne’e presiza ba atu liu fali mehi ida, no tenke inklui informasaun barak tan kona-ba oinsa atu finansia kustu planu ne’e no osan sira ne’e mai husi ne’ebe. Partikularmente, ami preokupa liu katak PED sei finansia liu husi halo divida, maibe iha dokumentu ne’e iha deit referensia oan ida, ne’ebe la spesifiku. PED ne’e totalmente ignora tiha defisit komersiu Timor-Leste nian ne’ebe maka’as tebes ne’e, ho prioridade oituan atu hamenus importasaun. Ida ne’e inklui mos informasaun sala kona-ba matrikula eskola nian, inflasaun no dependensia ba petroleu. Ne’e optimistiku ne’ebe injustifikavel kona-ba posibilidade deskobrimentu kampu mina-rai nian iha futuru, exportasaun ba ASEAN, redusaun kresimentu populasaun nian. PED tenke fokus liu ba infraestrutura humana no intelektual ba edukasaun (konstrusaun seidauk sufisiente), hadiak kualidade no mos kuantidade edukasaun, no suporta nesesidade Timor-Leste no ita nia povo sira, laos deit empregadores ne’ebe posivel. Diskusaun pozitivu kona-ba protesaun ambiental iha PED ne’e hetan ameasa husi numeru projeitu ne’ebe perigozu ba ambiental ne’ebe dadauk ne’e lao hela lahoo analiza ba impaktu ambiental. Analiza, informasaun no prioridade tan tenke foka ba enerzia renovavel. Lei ba rai tenke rekonhese injustisa kolonial, sistema titulu nian labele fo amesa ba direitu rai nian ka halo diskriminasaun hasoru rikeza agrikultor kiak sira. Presiza liu tan konsultasaun kona-ba lei ba Rai, no Lei no PED tenke konsidera valor lolos husi rai ba povo sira, laos deit nia util ba investor sira. Justisa Ekonomiku ba povo tomak, laos deit eradikasaun ba pobreza extrema, maibe tenke sai planu ekonomiku ida ne’ebe objektivu. Aumenta turismu presiza esforsu ne’ebe maka’as duke hari infraestrutura fiziku. Investimentu seitor privadu sira tenke fo benefisiu, laos atu uza hotu rekursu povo nian. Kua taxa, zona ekonomia special no favour seluk ba bisnis estranjeiru nian imposivel atu produs vantazem ba ita nia povo. Investimentu estadu nain iha atividade bisnis nian, hanesan Tasi Mane no importasaun fos, presiza analiza ida ne’ebe kuidadu husi nia kustu no benefisiu nian. Jestaun seitor publiku no boa-governasaun sei haforsa liu tan husi dezenha strutura institusional atu luta kontra korupsaun, no haforsa sistema-luan Governu nian ba orsamentu, aprovizionamentu, kontratu, salariu no informasaun publika nian iha ajensia estadu tomak nia laran. Maske seksaun makroekonomiku ne’e diak liu ona duke esbosu primeiru, maibe ida ne’e nafatin iha frakeza, no presiza fokus liu tan ba natureza rendimentu riku-soin rekursu naun renovavel. Grafika ne’e onestu liu tan kona-ba dependensia petroleum, inflasaun, kresimentu populasaun no planu ba gastus no imprestimus iha futuru hodi finansia planu ida ne’e. Ita labele fiar katak Timor-Leste bele atinzi real, longu prazu, GDP naun-petroleu annual nuan iha 11.3%, liu fali nasaun sira seluk nia istoria dadaun. Exepsaun Xina, nasaun sira ho performa diak liu tan atinzi deit 6.5%-7.5% no ne’e la imazinavel atu ekspeta Timor-Leste bele iha kresimentu dala rua liu fali buat ne’ebe sira bele. Nivel rapida atual nian eskalada husi gastus publiku nian, motor principal ba ita nia ekonomia, imposivel atu sustentar. Informasaun seluk, inklui proposta PED no tekstu tomak husi ami nia komentariu, bele hetan iha La’o Hamutuk nia pajina web iha Ingles no Tetum. The Strategic Development Plan (SDP) is an important document, and is greatly improved over the version circulated last year. However, it is a large document, with many new ideas, and deserves thorough discussion before being enacted. We find it irresponsible that the Council of Ministers approved it after an all-night meeting, and it would be unconstitutional for Parliament to approve it less than a week after they received it. The Plan includes a welcome focus on social capital, not only physical infrastructure as pervaded last year’s discussions. We hope that future budget priorities reflect this, and that some of the 52% of the 2011 State Budget allocated to physical infrastructure will be redirected to education and health. We agree that a plan is not a budget, but it needs to be more than a dream, and should include more information about what it will cost and where the money will come from. In particular, we are concerned that the SDP will be financed by taking out loans, but there is only a passing reference to this in the document, with no specifics. The SDP totally ignores Timor-Leste’s mammoth trade deficit, with little priority to reducing imports. It includes incorrect information about school enrollment, inflation, and petroleum dependency. It is unjustifiably optimistic regarding possible future oil discoveries, exports to ASEAN, reducing population growth,. The SDP should focus more on human and intellectual infrastructure for education (buildings are not enough), improving the quality as well as the quantity of education, and supporting the needs of Timor-Leste and our people, not just possible employers. The SDP’s positive discussion of environmental protection is threatened by a number of environmentally dangerous projects currently underway with no environmental review. More analysis, information and priority should be given to renewable energy. Land laws must recognize colonial injustices, and titling systems should not endanger land rights or discriminate against cash-poor farmers. More consultation is needed on the Land Law, and the Law and the SDP should consider the true value of land for people, not only its use by investors. Economic justice for all our people, not only the eradication of extreme poverty, should be the plan’s economic objective. Agriculture should promote food sovereignty. Organic, sustainable agriculture, growing products for local consumption, should be the priority, and farmers must be involved at every level of decision-making and implementation. The “Green Revolution” model of industrial, high-input agriculture has severe negative impacts in the long term. 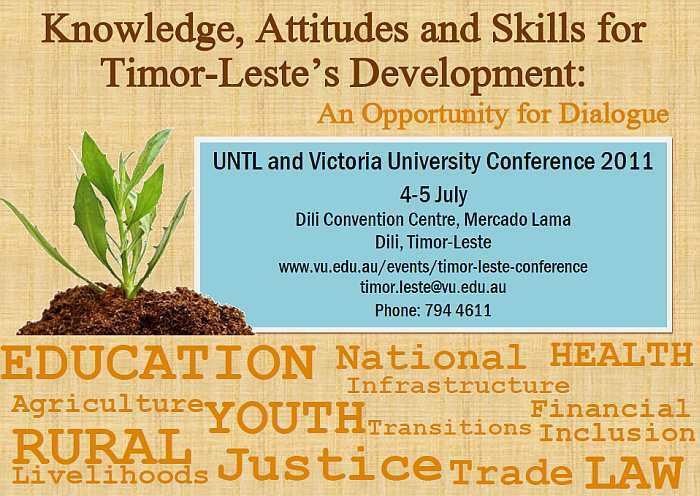 Timor-Leste needs a broader vision of economic development. Since there is consensus that Timor-Leste needs to move away from oil-dependency in the long-term, we are disappointed that petroleum processing is the only industrial development discussed. What about agricultural processing, or light industry to replace imported products? The capital-intensive oil industry will provide few jobs for anyone, including Timorese. Allocating most of our intellectual and financial resources to the petroleum sector obstructs moving to a non-oil economy after oil and gas reserves are used up in 13 years. Current processes to revise the Petroleum Fund Law, create the TimorGAP national oil company, and invest heavily in feasibility studies for the Tasi Mane Petroleum Corridor contradict the goals of the plan and exacerbate our dependence on petroleum and the danger of long-term economic instability. They need to be undertaken with more care, and balanced against ideas and needs of other sectors. Increasing tourism requires more effort than merely building physical infrastructure. Private sector investment should provide benefit, not use up people’s resources. Tax cuts, special economic zones and other favors for foreign businesses are unlikely to produce advantages for our people. State investment in business activities, such as Tasi Mane and rice importation, needs more careful analysis of its costs and benefits. The security sector plans should serve the national interest. Human and budgetary resources spent on F-FDTL can be reallocated as external threats become smaller. Public Sector management and good governance will be strengthened by designing institutional structures to resist corruption, and by having all state agencies use strengthened, government-wide systems for budgeting, procurement, hiring, salaries and public information. Although the Macroeconomics section is better than earlier drafts, it is still weak, and needs more focus on the temporary nature of non-renewable resource wealth revenues. It should be more honest about oil dependency, inflation, population growth and plans for future spending and borrowing to finance this plan. It is inconceivable that Timor-Leste can achieve real, long-term, annual non-oil GDP growth of 11.3%, higher than any country in recent history. Other than China, the best performing countries have grown 6.5% - 7.5%, and it is wishful thinking to expect Timor-Leste to grow nearly twice as fast as they could. Current rapidly escalating levels of public spending, the primary driver for our economy, are impossible to sustain. Additional information and analysis, including the proposed SDP and the full text of our comments, is available from La’o Hamutuk’s website in English and Tetum, which we will continue to update. La'o Hamutuk has scanned and posted the Portuguese-language, 234-page proposed Strategic Development Plan that the Government presented to Parliament this week. The Prime Minister has urged Parliament to approve it on Monday, 11 July, before the Development Partners meeting. For the SDP documents, and more information, click this link. Update: On Thursday afternoon, the SDP was posted to the Government portal website in English (16 MB) and Portuguese (4 MB). On 11 July, as Parliament began debating the Plan, La'o Hamutuk circulated our preliminary analysis. 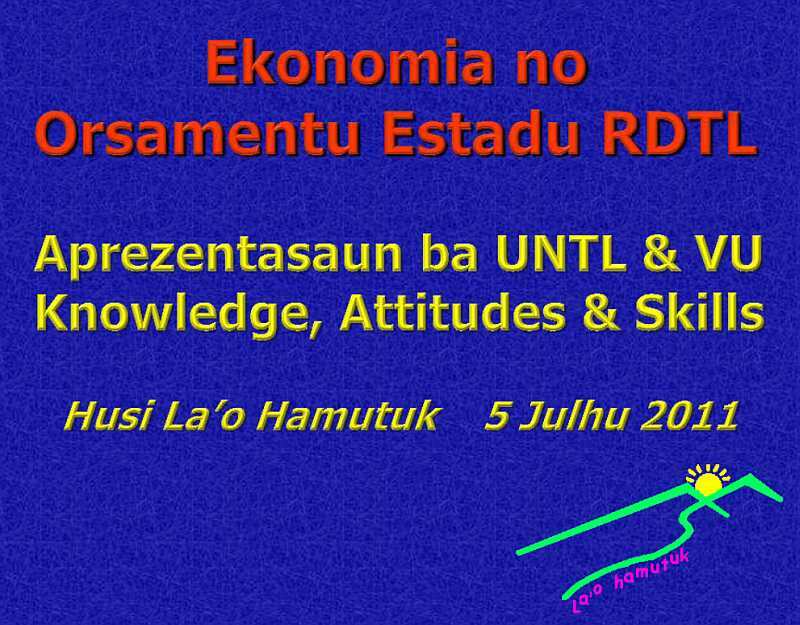 On July 5, La'o Hamutuk made a presentation on Timor-Leste's Economy and State Budget to the conference on Knowledge, Attitudes and Skills for Timor-Leste’s Development organized by UNTL and Victoria University at Dili Convention Centre. We have posted our presentation, which discusses hard realities relating to economics, budget and development in Timor-Leste to our website in English and Tetum. 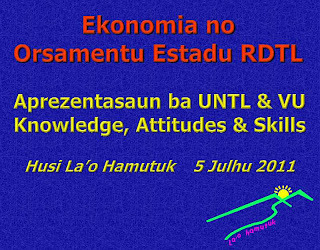 Iha loron 5 fulan Julhu, La'o Hamutuk fo aprezentasaun ida kona ba Ekonomia no Orsamentu Estadu iha konferensia kona-ba Konhesimentu, Atitude no Kapasidade ba Dezenvolve Timor-Leste, organiza husi UNTL no Universidade Victoria iha Merkadu Lama. Ami tau ona ami nia aprezentasaun iha web iha Tetum no Ingles. Nia diskuti realidade kona-ba ekonomia, orsamentu estado no dezenvolvimentu iha Timor-Leste.